Paul on his market stall in Galway City. We are on St. Nicholas Market every Saturday from 9am - 4.30pm. We are just off Shop Street in Galway. Our stall is halfway down Church Yard Street. Needless to say, we are a traditional family bakery business... and that means I am often on the stall from 8 o'clock in the morning, so if you fancy some fresh bread for breakfast (or cakes, even; who am I to judge!) then pop down a little earlier and we will gladly oblige. We usually stay on a little later too; 5 o'clock in the evening would be common. Come on over and meet us. You might even pick up a tasty deal! The Market is roughly halfway in-between the famous Eyre Square and Spanish Arch, and is easy to find. Just ask anyone in the city. We have included a Google map below, if you need an extra hand. "Galway's famous bustling market has been trading in Church lane by St Nicholas' Church in the centre of the city for literally centuries. 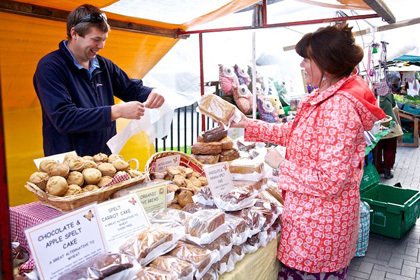 You will find hundreds of stalls selling fresh produce and locally produced crafts. Many people come to the market to chat as well as to shop and it's a good place to meet local artisans and hear local issues discussed." We also provide a wholesale service. If you are interested in having a ready-supply of artisan breads and cakes in your retail outlet, then drop us an email with your name, number and your general enquiry and we'll get back to you as soon as we can. Go to the contact page for more details on how to get in touch. Moyglass Bakery, Moyglass, Loughrea, Co. Galway, Ireland. All images on this site copyright Moyglass Bakery. We use all organic flours in our baking, and we are certified by IOFGA.